The GASIG met Saturday, October 14, at Mac Business Solutions in Gaithersburg, Maryland. We packed the room. It was -- almost -- standing room only. Sonny Tohan of Mac Business Solutions had arranged with Canon for us to have four of their latest model digital cameras, ranging from “a point and shoot” to one of their high end prosumer level SLR's. (For more information on the cameras, visit the links below.) After my introduction and welcome, Sonny went over the basic features of each camera, and then turned them over to volunteers from the group to take some pictures. Rachael Payton, a lovely young lady, graciously volunteered to “sit” for us, and was soon surrounded by quite a group of avid photographers, snapping away. 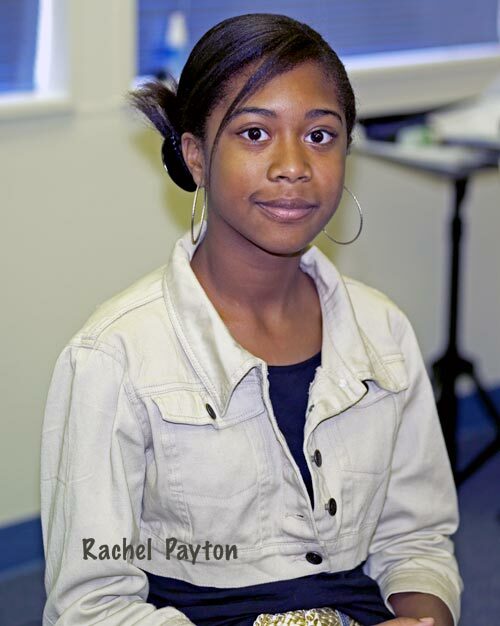 Rachael Payton graced the Graphic Arts SIG as the very model of photogenic beauty. We also took some shots outside, then after reassembling back inside, Sonny downloaded the shots from the various cameras and we compared the results. Though we made no attempt to reach a formal consensus, most would agree, I think, that all the cameras took excellent photos. My favorite was the new Canon digital Rebel XTi, which combined the ease of a “point and shoot” with many of the features and controls of the prosumer level cameras. To top it off, we selected one of our favorites images of Rachael and, using one of the new HP series printers, Sonny printed out an 11 x 14 glossy print of our Rachael, which was stunning. Our thanks to Sonny for an excellent presentation on camera possibilities; to Mac Business Solutions (MBS) for providing such great facilities and support; and to Rachael Payton, our lovely model for enhancing the program. For more information on the digital cameras we used at Mac Business Solutions, Gaithersburg, check out the links below.